Die Erfolgssicherheit zylindrisch orientierter Implantate liegt nach internationalen Statistiken im 5-Jahresintervall bei 85–90 %. Sie ist im Wesentlichen vom Eintreten bzw. der Vermeidung einer Infektion abhängig. Durch geeignete Maßnahmen wie einer konsequenten Hygiene und Prophylaxe, ist es daher möglich, die Erfolgsquote im 10-Jahresintervall auf nahezu 100 % zu steigern. (Dies gilt für Nichtraucher) Es sind Liegezeiten von mehr als 40 Jahren bekannt. Mit diesen Zahlen gehört die zahnärztliche Implantologie zu den erfolgreichsten medizinischen Eingriffen überhaupt. Ein Zahnimplantat ist ein in den Kieferknochen eingesetztes Teil in Form einer zylindrischen oder konischen Schraube aus Titan. Auch Keramik-Implantate sind bei verschiedenen Indikationen eine gute Alternative. Durch ihre Verwendbarkeit als Träger von Zahnersatz übernehmen Zahnimplantate die Funktion künstlicher Zahnwurzeln. Hierzu werden sie mittels Schraubgewinde in den Kieferknochen eingedreht. Sie verbinden sich innerhalb von 3 bis 6 Monaten ( Osseointegration ) mit dem umgebenden Knochen zu einer festen, äußerst belastungsfähigen Trägereinheit. Der Eingriff erfolgt üblicherweise in Lokalanaesthesie und ist weitestgehend schmerzfrei. In vielen Fällen kann auch mittels Schleimhautstanze der chirurgische Eingriff auf ein Minimum reduziert werden und ist somit weitgehend unblutig (Siehe auch Guided Surgery). Unter Abutment (Aufsatzteil) versteht man jenen 2.Teil des Implantates, welcher üblicherweise in den 1. Teil , das eigentliche Implantat, eingesetzt wird und sodann mit diesem verbunden ist. Über das Abutment wird in Folge die Suprakonstruktion (Zahnkrone etc.) angefertigt und darauf befestigt. Minimal-invasive treatment –Minimal-invasive means in medicine, especially in surgery and also with interventions in mouth-jaw areas, with less invasion from instruments and small cuts in the tissues than the conventional open operation method. 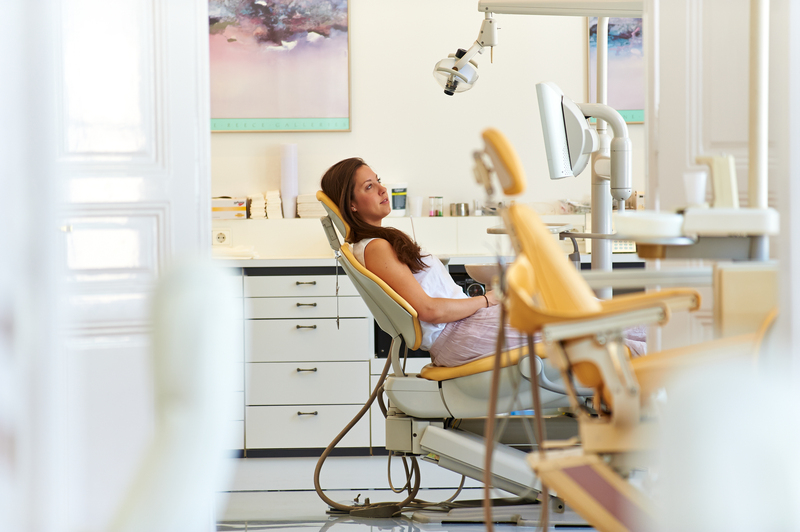 The healthy tissues or the healthy teeth in the surrounding area of the operation wound will be protected(saved?). A substantial advantage for the patient is minor swelling and less post operative pain. 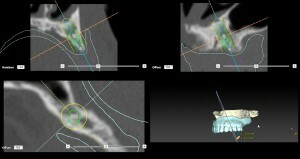 Also the diagnostic serves as a procedure, in which prior to the operation, a 3 dimensional xray with an exact planning of transmission of the jaw situation in a computer planning program is possible. The teeth implants can then be accurately inserted also when the gums will not collapse within a minimal invasive intervention. The minimal invasive treatment requires alot of experience by the operating surgeon. If he wants to navigate within a small area he should in any case dominate in an open conventional operation, in order to avoid these problems in a technical way. The minimal invasive operation technique sounds attractive for the effected patients. Under no circumstances should it only be allowed to do minimal invasive, compromises on fundamental requirements of implantology. 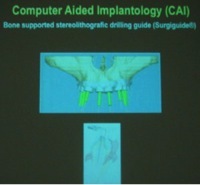 Among other things there should be sufficient bones available in order to securely stabilize the implants. Minimal-invasive (Stanz-Technique) and guided surgery, Stencil techinology, CAD/CAM procedures, tilted and ultra-short implants, single tooth and multiple gaps, all on 4/all on 6 technology (treatment for edentulous jaw with 4- to 6 implants and treatment of a fixed dental prosthesis by means of a crown bridge technology/technique), sinus lift, bone building/augmentation, bone splitting and distraction, ceramic implants. Delayed immediate implants and late implants reduce the risk of an infection. Single root teeth in regions with thin vestibular bone lamellar (for example in the frontal teeth area) have the immediate implants or delayed immediate implants (within 2 weeks) though an advantage, in which the bone loss and therefore minimizes the risk of an aesthetic failure. 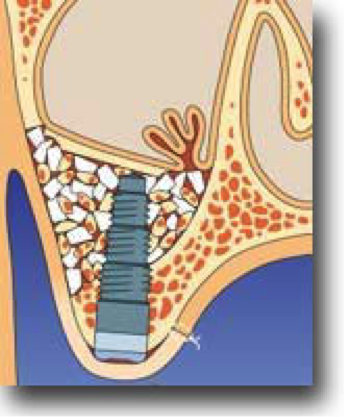 Immediate implants should only be inserted when after the extraction of the tooth from the alveole is free of infection. Example: upper front teeth, lower premolar etc. Front teeth are preserved and also most of the adjoining side teeth, however the back teeth are missing. 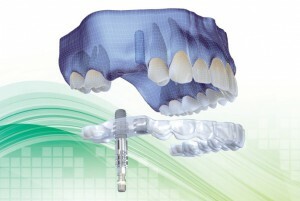 Example: Replacement of teeth 36 and 37 in the left lower jaw. For the anchoring of a fixed tooth replacement: in the toothless upper jaw are minimum of 4 to maximum 8 implants required, in the toothless lower jaw a min.4 to max. 6 implants. Should the implemented OPTG-xray -CT/DVT prove that the existing bone supply on the desired position is inadequate, there are different methods of rebuilding the jaw bones through the use of, in part, simple operating measures (Augmentation). 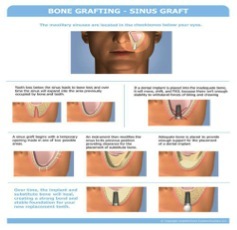 Bone- splitting, distraction, and well-known Sinus lift belongs to the most common procedure; these can be implemented normally with a local anesthesia. Comprehensive visualization and prosthetic oriented implant planning facilitate in reaching results – also by demanding surgery applications. Guided Surgery offers a reliable pathway to minimal invasive surgery, to temporary and immediate maintenance and is therefore situated to be able to lesson bone transplants to a minimum. Reduced time and labor during the operation and optimized communication all carry an increase of efficiency. perform regeneration procedures in order for bones and soft tissue to rebuild. The use of bone substitutes and membranes is in the meanwhile one of the standard therapeutic approaches. Our endeavor ist o offer you a wide palette of predictable and scientifically secure treatment solutions. The success of the cylindrical oriented implants lies in the international statistics of 5 year intervals of 85-90%. It is essentially dependent on occurences of, for example, an avoidance of infections. Through appropriate measures, like proper hygiene aan aprophylax, it is possible to increase the success rate in 10 year intervals up to 100%. (This applies to non-smokers). There are also periods of inactivity of more than 40 years. With these statistics dental implantology belongs to the most successful medical procedures overall. Together in a joint discussion and with the help of modern technology we will gladly develop an individualized concept for you. 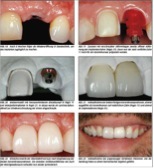 Today implant procedures are increasingly becoming not only merely functional but also considered aesthetic aspects. With the approximately 40% of all implants it is necessary also to perform regeneration procedures in order for bones and soft tissue to rebuild. The use of bone substitutes and membranes is in the meanwhile one of the standard therapeutic approaches. Our endeavor ist o offer you a wide palette of predictable and scientifically secure treatment solutions.